Willy returns to the past on several occasions. Look at each of these ‘visits’ and say what they tell the reader about Willy. As Willy has grown older he has trouble distinguishing between past and present, between illusion and reality an is often lead through flashbacks where much of the story is told. The flashbacks usually show the summer after Biffs senior year of high school when all of the family problems began. Willy has many encounters with his past. The first one we come across is when Willy has returned home, talking to Linda about his day, when he says something about the car, “I was thinking of the Chevvy” the Chevvy that he drove was of happy memories however it makes the reader feel that Willy is a bit confused at first because he says he could not open the car window. Also it states that the car is of high importance to Willy. There are many encounters with the car later on. When Willy is describing his journey he mentions the scenery too, “ but it is so beautiful up there, Linda, the trees are so thick and the sun is so warm” it is the scenery that has made Willy so happy and thinking of the Chevvy. This refers back to the stage directions when Willy returns back for another visit to the past, it is said that “ The apartment houses are fading out and the entire house and surroundings become covered with leaves” this may be that the pas has something to hide, and sets a scene of a better more happier life, a change in mood and the coming of the past. This is where the hope of the American Dream comes into the play. Willy is ambitious in wanting Biff to succeed, in the way that he know he did not but does not want to come to terms with. Will seems to be proud of what he does, even though it does not pay a lot of money, and when he knows that Biff is not doing so well he returns back to the past where he remembers the good football days. It is as if Willy returns to the past in times of trouble, where he seeks for happiness in the past, whereas the present has not even come yet. 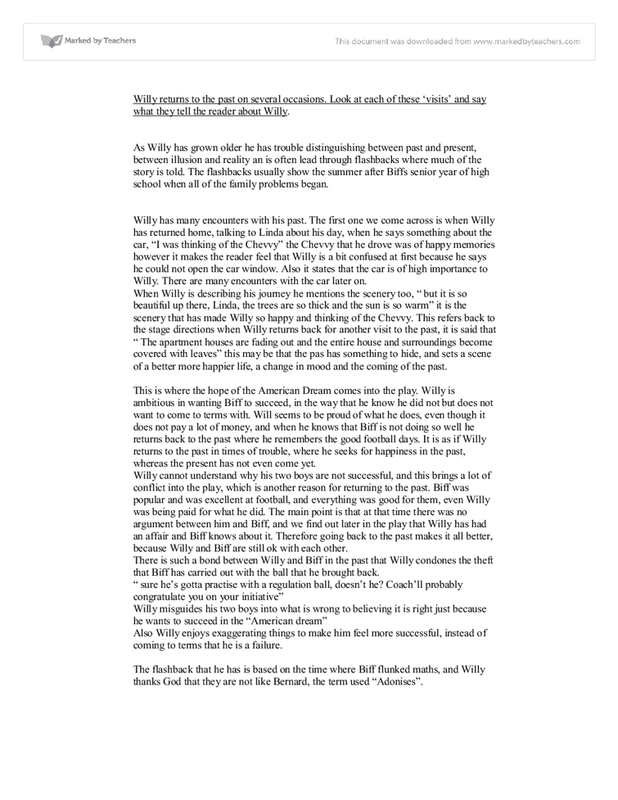 Willy cannot understand why his two boys are not successful, and this brings a lot of conflict into the play, which is another reason for returning to the past. Biff was popular and was excellent at football, and everything was good for them, even Willy was being paid for what he did. The main point is that at that time there was no argument between him and Biff, and we find out later in the play that Willy has had an affair and Biff knows about it. Therefore going back to the past makes it all better, because Willy and Biff are still ok with each other. There is such a bond between Willy and Biff in the past that Willy condones the theft that Biff has carried out with the ball that he brought back. Also Willy enjoys exaggerating things to make him feel more successful, instead of coming to terms that he is a failure. The flashback that he has is based on the time where Biff flunked maths, and Willy thanks God that they are not like Bernard, the term used “Adonises”. Another visit is Willy is talking to Linda and she is mending stockings, where there is a link between the stockings and the woman, who we learn that Willy has had an affair with. However as Linda is precisouly tying to comfort him, her laugh is mixed merged in with the Womans laugh, which is considered more as a mocking laugh. Willy feels flattered once the woman has come onto the stage, and talking to him making him feel popular and over confident with himself. And as she leaves the room, she mentions “I’ll put you right through to the buyers” its almost as if he was with the woman to gain his success. He is trying to sell himself , but its just not possible because as Willy has said before there is not much to sell, therefore trying it this way would allow him to move up in the success ladder, but not all that simple. When the audience first encounters Ben, he represents the success that Willy is striving for. Before the audience learns of the success that Ben encountered in Africa, they see him on the stage accompanied by an idyllic musical motif similar to that of Willy's father. His father also symbolizes success. However, it is soon clear that Ben actually represents the death that Willy will inevitably encounter. Ben appears to the audience at times when Willy is feeling most low and possibly contemplating suicide. Ben also criticises Willy when talking about his father, again showing success that Willy could never make. Throughout his visit with Ben, Ben repeatedly say “ when I walked into the jungle, I was seventeen. When I walked out I was twenty one. And, by God, I was rich!” Willy only remembers this which Ben said, hence the reason it is repeated many times. It could be that these words were going round in Willys head, showing just how much better Ben was than him, also teaching his boys this way of thinking. Willy cares a lot about his car and on numerous occasions brings the subject of it when teaching his boys on how successful he is. The car showed status just like the refrigerator that they have, although are not able to pay enough money for it. In the past he has mentioned that the “Chevrolet, Linda, is the greatest care ever built” he is dependant on the car. “I can park my car in any street in New England” this could also be reflected onto Willy, he is trying to persuade the everywhere they want him, he is successful, and due to his successfulness they allow his car. If his car is accepted then so is he. However now that he does not have the “Chevrolet” then he has no personality either. After all his flashbacks his last one leads him to finally do what he has been wanting to do for a long time. Willy, has become obsolete, living in the past and not facing the present tells us that he is running away from accepting he is a failure, from all the problems that have been created. His unstable mind makes him contradict himself in the first scene when he complains, "Biff is a lazy bum" and moments later, "There's one thing about Biff, he's not lazy." Willy is not portrayed by Miller as a bad character. In this moving and powerful play, Miller uses many characters to contrast the difference between success and failure within the system. Through a combination of various literary elements, Arthur Miller is able to show the dissolution of a man whose values have been shown to be futile and whose dreams have turned to dust. Many years later, on the eve of the play's Broadway opening, Miller's mother found the story abandoned in a drawer. 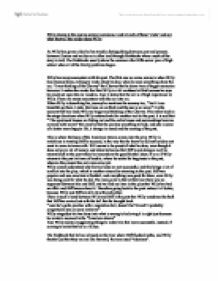 ===================================== Sidebar: Arthur Miller's inspiration for Death of a Salesman came from many sources; most importantly however, it came from paying close attention to the lives of the people around him. The characters are not conditioned solely by the society they live in. They often have choices but often choose wrongly. I believe that there are three ways of viewing 'Death of a Salesman'. Firstly, this play is a modern tragedy. And so we conclude that Eddie is purely a tragic hero, he had some character flaws that motivated him a lot, making him act in a thoughtless way, until he reached his point of .from this point onwards he started falling until he met his deadly end. He tells this to Willy who is outraged. Willy shouts, "I am not a dime a dozen! I am Willy Loman and you are Biff Loman!" At the end of the play, Biff realizes the illusions that Willy lived on.